Zara Studded Black Ankle Bootie (similar here and here from TARGET! After officially adding the leather skater skirt to my fall wish list, I was super pumped when I ordered it at the beginning of August. And boy, was it a trial and a half trying to get it delivered. But I'm thankful that it finally arrived on my doorstep because it's most definitely going to be a fall favorite. Definitely one of those pieces that will transition from season to season - so get your hands on one ASAP! Today I'm teaming up with Laura from Walking in Memphis in High Heels to prove that neon isn't going anywhere! I love Laura's blog - she's always wearing super chic outfits that are definitely style inspiring. Laura's got the perfect combo of girly yet wearable down pat. Plus, her hair is gorgeous - like the most perfect curls. Seriously wish I could get mine to be like that! I laughed when we sent each other pictures of our looks for this neon collab. It's the same outfit idea but we each put our own spin on it - and I swear we didn't even plan it that way! :) So make sure you check her blog out! Are you as ready for fall as I am?! Cute outfit. Love the leather skirt! Just found your blog and I love it! You have amazing style! I love that leather skirt. Such a gorgeous look! I've been on the hunt for a leather skater skirt. Yours is perfection. Love your neon look! 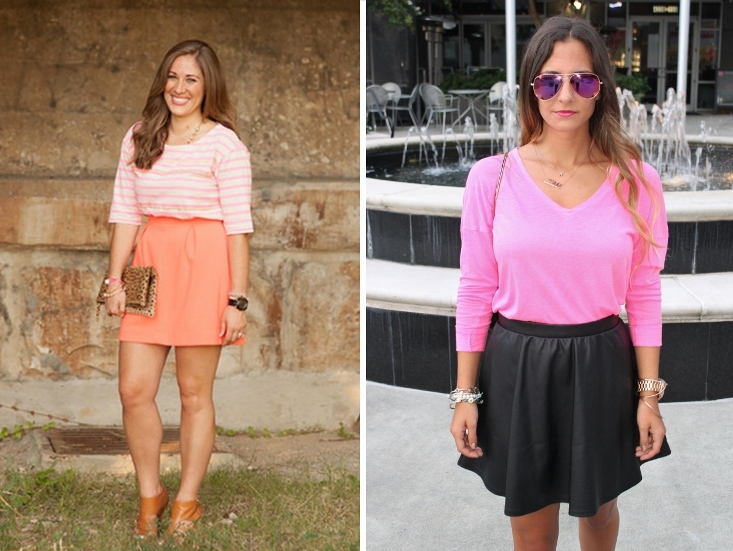 That leather skater skirt is too cute, and it looks great with the neon pink! Beautiful! Neon was made for you and that leather skater skirt is just perfect. Love this early fall look and I'll be rocking my neon into fall too! This is cute skirt. :-) Loving the booties as usual. You girls look great! What a fab outfit you have on today Nikki! This is adorable Nikki! I LOVE your boots! The whole pink and leather look is gorgeous! I love this cool and edgy outfit! Oooh I love that leather skirt! I used to think that I wasn't a leather person, but lately I've really been into it. I have my eye on a cute brown leather tee - maybe I'll finally be able to pull the trigger! I'm totally LOVING your leather skirt!! I've got to scoop one up ASAP! Super cute outfit! I am loving the neon sweatshirt and the sunglasses! Haha! I don't think I'm as excited for fall as you are...I wish we could have summer year round! But I guess the only thing that excites me are the clothes and the ability to layer without melting! Another plus is wearing leather. And I must say you have done an outstanding job of styling your leather skirt:)! Love the outfit girl! You both look beautiful! And thank you so much for the kind words on my feature:)! Thanks for your sweet comment! :) I believe the blazer is even more reduced on Zara now. ;) Love neon btw. you look STUNNING! girl i am loving those black booties! going to have to check them out..been on the hunt for some! I love this look, those booties are amazing! The sunglasses are a great accessory with a leather skirt! Thanks for your comment girl, your fabulous ! out of the neon colors. This look is so great! Of course I love neon, but the way you paired it with the leather skirt and black booties- so cute! I could definitely see myself rocking this look! Great collaboration with Laura and thanks for stopping by Patti Cake! This is so great - love the color! Would love for you to come by my link up Friday! I love your skirt and booties together!!! Such a pretty outfit! Beautiful outfit! Love that pink neon shirt with the leather skirt - stunning! OMG you ladies look awesome in your skirts.....seeing you I also wont want neon to go away!! !